One feature most of these newfangled Northeast IPA brewers have is that they make, like, a hojillion different varieties of IPA. To all the normals out there, this must seem baffling in the extreme. How different can all these IPAs be? Us abnormal hop-sniffing degenerates know what's up though, and these two cans of Other Half that recently found their way to Kaedrin HQ are a pretty good example of distinction. Beer Nerd Details: 8.5% ABV canned (16 ounce pounder). Drank out of a tulip glass on 7/22/16. Canned 7/15/16. Batch: Double Downer. Beer Nerd Details: 8.5% ABV canned (16 ounce pounder). Drank out of a tulip glass on 7/22/16. Canned 7/15/16. Batch: Kazaam! Many thanks to fellow BeerNerd Sheik for making the long trip to Brooklyn and waiting in line for these beauties. 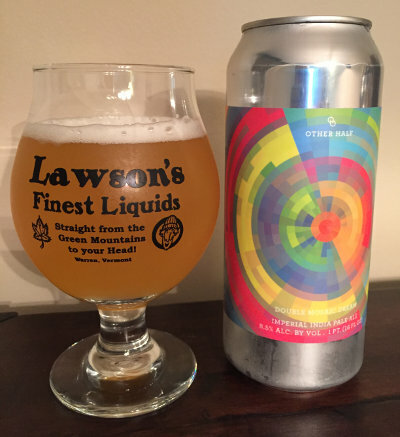 Other Half is clearly the real deal and if I didn't have Tired Hands in my backyard, I'd probably be seeking this sort of thing out more often. As it is, I'm still going out of my way to snag their stuff, so there is that. You will no doubt hear more about them soon. * But you rated Victory's Ranch S an A-!? Two answers to this: 1. Grade inflation is real and b) I'm the worst. This has been established. This page contains a single entry by Mark published on July 28, 2016 8:37 PM. 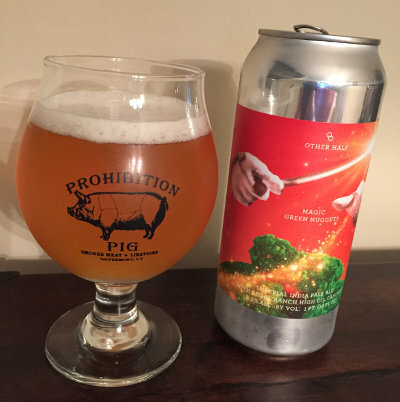 2SP Barrel-Aged Dead of Night Saison was the previous entry in this blog. Operation Cheddar V: Bride of Cheddar is the next entry in this blog.